How to design a Courtyard House? Courtyard houses are large houses with a central open space in between surrounded by the main part of the building. Most of the rooms in the house open in the central courtyard. The central open space serves as a place where the family gathers for chatting and spending time together. Generally, the exterior walls of the rooms that open to the courtyard do not have windows. Their lighting and ventilation happens through the courtyard. In the sixteenth century, noblemen in England stopped building castles and preferred courtyard houses. 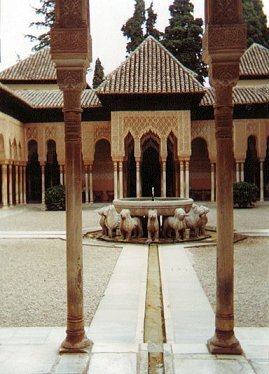 Granada Alhambra is an historical structure with a central courtyard. Spend some time visualizing and sketching your ideas of a courtyard house. Begin designing with a bubble diagram. It ensures efficient connectivity between different spaces of the courtyard. Courtyard house design, Difference between a courtyard house and other homes, Guide to designing a courtyard house, What is a courtyard house?